The Woods’ first win in NASCAR’s biggest race, the Daytona 500, was not only one of the all-time feel-good stories in auto racing but an unexpected victory as well. 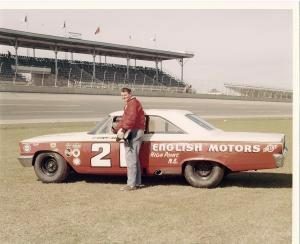 The story began 10 days before the 1963 running of the 500 when the Woods’ regular driver, Marvin Panch, who had already qualified the No. 21 for the Daytona 500, was testing a Maserati sports car at Daytona International Speedway. Panch, racing on narrow tires with little grip compared to the treaded tires used in NASCAR at that time, lost control of the car and it turned over. The doors of the Maserati, which wrapped up over the top of the car, pinned him inside as fire broke out in the car. Glen Wood, NASCAR official Johnny Bruner, driver Tiny Lund and two others saw the crash, jumped in the station wagon Bruner was driving and sped to the crash scene. Others scaled a fence and came to Panch’s aid. Lund, being the biggest and strongest of the rescue party, used his brute strength, and that was key to freeing Panch, Wood said. For his efforts, Lund later received the Carnegie Medal of Honor. With Panch in the hospital being treated for his burns, the Woods were left to find a replacement driver for the 500. Good drivers were hard to come by at that point. With qualifying for NASCAR’s biggest race already done, most of the sport’s top talents had commitments with other teams. That made the decision a relatively easy one. “Tiny was a pretty aggressive driver despite his weight, which was about 280 pounds at that time,” Wood said. Despite Lund’s ability to be aggressive when necessary, the Woods saw an opportunity to try to win the race on fuel mileage and adopted that strategy. “It had rained, and they started the race with the track still damp,” Wood recalled. The first 10 laps were run under the caution flag, and the Woods made their first stop at Lap 36. The treaded Firestones of that era actually performed better with some laps on them, so the gas man Kenny Martin refilled the fuel tank while Ray Lee Wood, Glen and Leonard’s brother, and Firestone representative John Laux checked the tires. Knowing they’d run the 40-lap qualifying race on a single tank of fuel, the Woods ran 40 laps before their next stop. Again, they just refueled and checked the tires. “We decided we could go 42 laps, so we did that the next two stops, which left us with just 40 laps to go until the end of the race,” Wood said. As the laps wound down in a race that ran caution-free after the initial 10 laps under yellow to dry the track, the Woods found themselves in position to finish the race without another stop while their competitors would need to stop for fuel. Until the final stop, Laux, the Firestone rep, had assured the team the tires were good to go. But he was reluctant to make a recommendation for the final 100 miles. But Ray Lee Wood said he felt like the tires would make it, so Lund and the No. 21 took off for the final 100-lap run with a full tank of fuel and 400 miles on the tires. As the laps wound down, one contender after another began making late-race stops for fuel. First Fred Lorenzen gave up the lead to stop for fuel with 10 laps to go. Then Ned Jarrett led briefly, but stopped with eight laps to go, leaving Lund out front. Lund told reporters at the track that he ran dry on the final lap, but Wood said that in Lund’s excitement over the victory, he was mistaken about the fuel. The victory was the Woods’ first of 15 Cup triumphs at Daytona, including five Daytona 500 wins. And it was the first anywhere on the Cup circuit for Lund, who had several strong runs in the No. 21 before Panch returned later in the 1963 season. Lund remained close friends with the Wood family until his death in a crash at Talladega on Aug. 17, 1975. “We got a Christmas card from him every year until he died,” Wood said.